This clinically proven, natural oil is targeted to reduce oil production and visibly reduce pore size. Rich in jojoba and proven natural active ingredients this oil has skin firming and antioxidant properties to help improve skin texture,elasticity and softness. *claims based on clinically study by Akott Evolution. **claims based on clinical tests using bakuchiol for 12 weeks, twice daily. Apply onto clean, damp skin. Use morning and night. 30ml/1.0fl.oz glass bottle with pump in a box. Jojoba is a golden liquid wax (often called jojoba oil) that is made from the jojoba bean. A plant native to Southwestern North America, it was highly valued by the Native Americans of the Sonoran Desert as a potent balm for skin ailments and a skin restorer. Today, it is clear why this liquid was so prized. Research has confirmed that the wax ester produced by the jojoba bean is similar to the protective wax produced by human skin that helps keep it smooth, supple and moisturised. 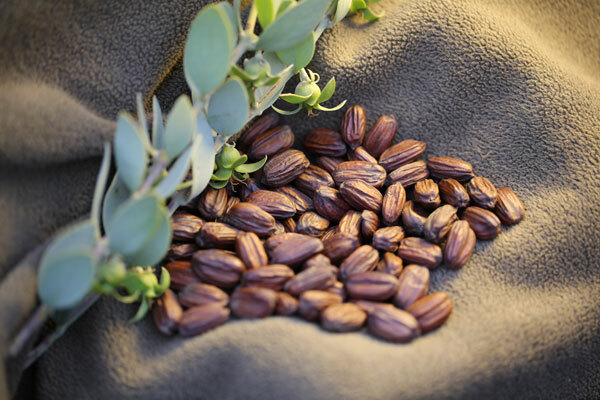 Jojoba mimics the skin’s natural oils and can penetrate deep into the skin layers. Jojoba is the only plant on earth known to produce this unique golden liquid wax. Compare the molecular structure of wax esters found in jojoba with wax esters found in our skin and you can see the identical double bonds present in both structures. This is what gives jojoba its unique ability to penetrate deep into the skin. Why Does My Skin Need Jojoba? About 30% of our skin’s sebum (the natural substance that coats our skin) is a natural wax ester. It helps kill germs, smother viruses and creates a protective barrier for locking in moisture. There are many reasons this protective wax ester in our skin diminishes. Loss is normal in mature skin and common after illness, poor nutrition or certain medications. This can leave your skin looking dry, tired and dull. Jojoba naturally contains a balance of vitamins A, D and E which are known as skin healing vitamins. Vitamins A. Jojoba is naturally rich in natural Vitamin A, and unlike synthetic formulas, is safe through pregnancy, for babies and adults. Vitamin A is important for skin cell regeneration and keeps skin healthy. The Jojoba Company OilEssential fatty acids omega 6 and 9 help to regenerate skin cells and repair damaged skin tissue. Powerful antioxidant properties: Able to penetrate down to the skin matrix level. Jojoba’s wax ester fills the gaps between skin cells, soothes and slows their metabolism, protecting skin against accelerated skin aging. Docosenol is a saturated fatty acid naturally contained in jojoba. Docosenol is antiviral and is used in cold sore treatments. We grow all our jojoba on our farm near Yenda in NSW. Our range contains nothing but pure jojoba. We personally manage the entire production, from nurturing the tiny seedlings to the meticulous cold press of our beans. The beans begin by naturally falling to the earth as they mature; before harvest we let them dry slowly on the ground, concentrating their nutrients. Only then do we move to pressing and filtering. By slowly and gently pressing the beans (the temperature never rises above 120°F (49°C), our cold pressed jojoba retains all of its vitamins and nutrients, along with that rich deep golden colour. We also filter fourteen times for absolute purity. Pale or clear jojoba has usually been heat filtered or refined, destroying precious vitamins and nutrients.